Felice Herrig prepared for UFC Fight Night on July 23, 2016, after she had recovered from a battle with depression. 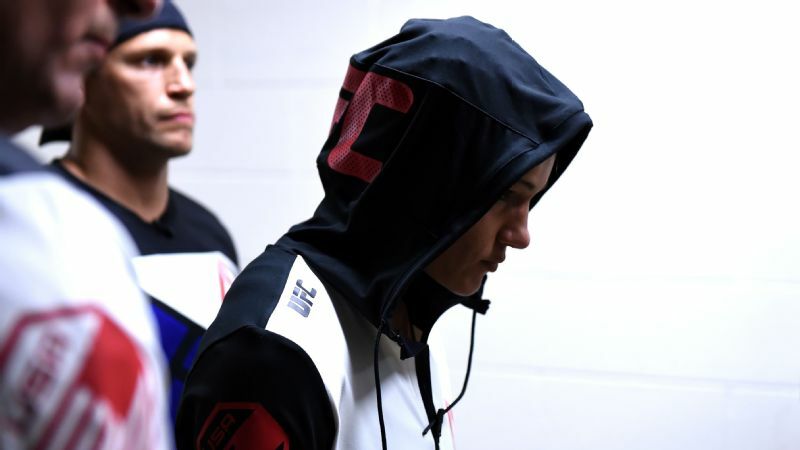 When strawweight Felice Herrig stepped into the Octagon at Chicago's United Center in July to the poppy chorus of Rachel Platten's "Fight Song," she did so as an MMA veteran with everything to prove. Clad in a simple blue sports bra and shorts -- but sporting her signature rainbow-spiked blond braids -- the then 31-year-old bore none of the theatrics that had become her calling card. Instead, she fought with a sort of murderous zen, throwing languorous left kicks and gracefully submitting Kailin Curran in less than two minutes. 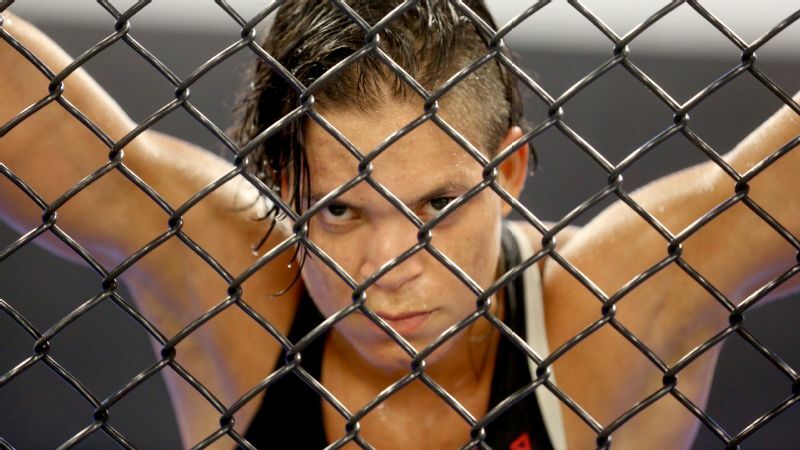 The look, the attitude, the fight -- it was all a far cry from the disastrous night of April 18, 2015, when Herrig took a humiliating tactical beating from Paige VanZant over three pulpy rounds at UFC Fight Night. You could call it the end of the beginning for Herrig, who disappeared from the fighting world for over a year after that loss. All of which made her comeback in Chicago last summer -- and her upcoming fight against Alexa Grasso at UFC Fight Night on Saturday -- less about redemption than about a decision to heal. Herrig celebrated after defeating Kailin Curran by submission in their women's strawweight bout during the UFC Fight Night in July. As a child growing up in Buffalo Grove, Illinois, Felice Herrig collected things. For a while, it was smiley faces, then business cards, then bouncy balls. When it came time for summer camp, Herrig's family couldn't afford to send her, so she went door-to-door fundraising. Perhaps part of it was fueled by want; in some ways, her family fell apart after the death of her youngest brother, and money was hard to come by. But there was always an obsessive quality to her. The daughter and sister of martial artists, 18-year-old Herrig approached kickboxing the same way she did everything else -- unrelentingly. "When I started, I knew I was going to make a career out of it," she says. "I knew how determined I was, and I was like, 'I'm going to become famous from this.' People didn't really believe me. They told me there was no money in it. I didn't believe anything they said." Herrig got her first shot at fame four years into her amateur kickboxing career with "Fight Girls," a 2007 reality show on Oxygen, followed by gigs with local MMA talk shows. She then made the jump to professional MMA and the self-branding she came to be known by. Weigh-ins at XFC, Bellator and Invicta were marked by the costumes she decided to wear --ones that were often comic-book inspired. She became a rabid Facebook and MySpace user, racking up thousands of followers, a feat for a young fighter in the early days of social media. "Everything just kept going viral, and I felt more pressure to always top myself," she says. "The stress built up, because I felt like that's what I was known for and that's what people expected." It's no secret that MMA fighters are often their own marketing departments. As one ascends through the promotions -- or rather, in order to ascend -- the honing of a social media personality becomes as much a part of the job as strength and conditioning training. 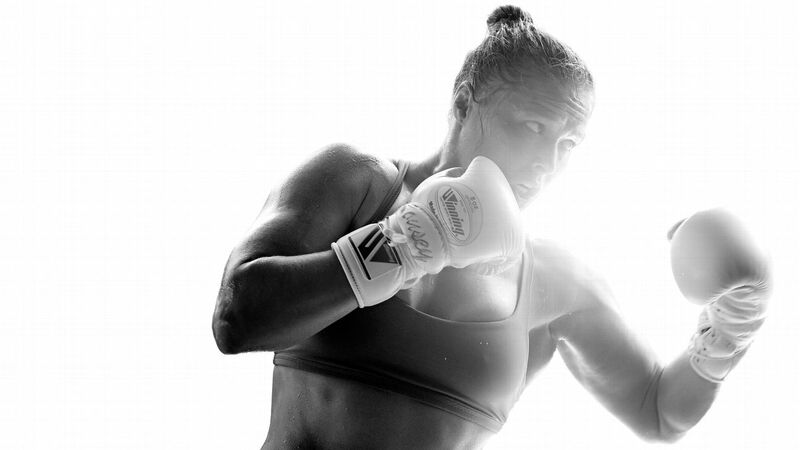 For a pretty female fighter, the stakes are raised even higher. "Looks are important as far as opportunity goes," Herrig, 32, says. "I was like, 'Well, I'm going to use it to my advantage,' because I loved fighting and wanted as many opportunities to fight as possible." With the added scrutiny, Herrig found a new thing to obsess over: her weight. Cutting pounds before a fight is a grueling task for most fighters. Herrig blames a lack of nutritional knowledge -- coupled with an obsession with looking thin on camera -- for what followed her stint on "Fight Girls": six years of starvation dieting and disordered eating. She went through raw food regimens, then added protein, cut sugar and juice-fasted, often while training hours a day for fights. "Every time I ate, I'd feel fat. I'd be afraid of gaining weight," she says. "I was trying to be healthy and trying all these diets to help with the weight cut before a fight, but it was also about being vain. Once I started eating a certain way and my body looked good, I started eating for looks rather than performance. That was a mistake." Within two years of "Fight Girls," Herrig was working her way through the promotions, one costume at a time. And as the chances for a viral weigh-in photo increased, her caloric intake decreased. She remembers cutting weight for one fight by splitting a single can of tuna over six meals. She was ragged, anxiety-ridden and plagued by insomnia. Training had once been a joy; now she struggled to get out of bed. "I was like a zombie in training," she says, her voice quivering. "Everything became about the weight cut." Then the UFC came calling. In the spring of 2015, nursing a media-tour hangover from The Ultimate Fighter 20, Herrig approached her second UFC fight, the bout versus VanZant, the way she always did -- with a vicious cutback on calories and a torturous six-hour-per-day training regimen. After a weeklong media blitz of 12-hour days, Herrig arrived at the Newark, New Jersey, Prudential Center in April 2015 running mostly on adrenaline. "I literally couldn't do anything," she says. "My body was numb." The pummeling she ultimately received at the hands of the decade-younger VanZant wasn't just a physical trial; it was a mental and emotional thrashing. Herrig, bottom, lost to Paige VanZant over three rounds at UFC on FOX 15 in 2015. "I didn't understand how this had happened," Herrig says. "I worked -- it's so hard because of how hard I work. My obsessiveness has been unconquerable. Starving yourself and training at the level I train at has just been torture. But I always felt that if I wasn't uncomfortable and if I wasn't torturing myself, then I wasn't disciplined enough." The rules Herrig had lived by for years had failed her, and a black depression followed, during which time she removed herself from the world of UFC. She contemplated never fighting again. At her lowest point, she entertained ending her life. It wasn't until naturopath Dr. Callum Cowan of Phenom High Performance Medicine in Ontario reached out that the smallest beam of light broke through. 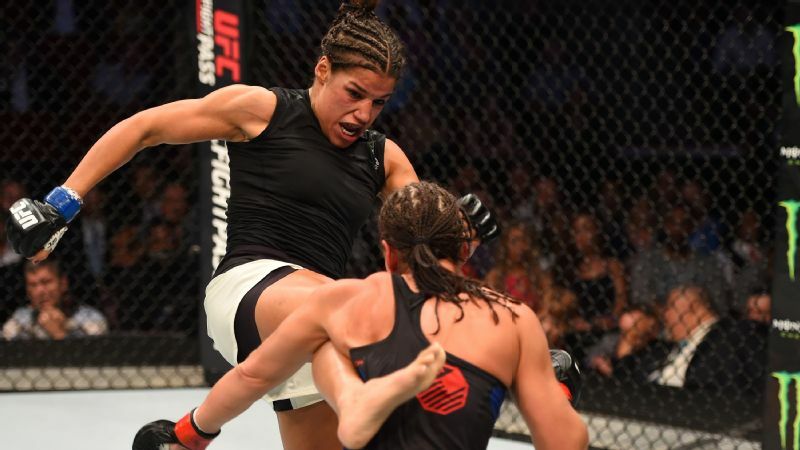 Cowan had worked with a number of fighters under Herrig's coach, Jeff Curran, and after Cowan watched her loss to VanZant, he reached out immediately. "Watching the fight, I could see right away there were some things that had to be fixed," says Cowan, who focuses on natural nutritional remedies for elite athletes whose biological systems are out of whack. Cowan was flown in by Herrig's team and ran several tests on the strawweight, who was still mired in her deep funk. The results arrived a month later and revealed a human body operating at about 25 percent to 30 percent of its capacity. With unbalanced levels of cortisol and DHEA hormones taxing her nervous system, and with parasites wreaking havoc on her digestive tract, Herrig was a physical and mental disaster. Cowan started her on supplements and rest and, in a move counter to everything Herrig believed in, increased her caloric intake. It took months for the changes to bear fruit, during which time a slowly mending Herrig cut back on social media engagement and media opportunities, trained only when she felt like it and adhered to a strict sleep schedule. She also met the love of her life, a kitten named Quinn (as in DC Comics' Harley Quinn), and added fruit sugar back to her diet. And as she did, a new Felice Herrig began to emerge -- or rather, the real Felice Herrig. Her social media, when she updated it, still featured plenty of training pics, but also vacations with friends, quiet time with Quinn, and, yes, the occasional baked good. By the time training camp began for the 2016 fight with Curran, Herrig was ready to try a new approach: listening to her coaches. "I did everything completely differently, and it was uncomfortable at times, because I didn't feel like I controlled the situation," says Herrig, who resumed a regular camp training schedule for both the Curran and Grasso fights -- albeit with more nutritional support. "After Chicago, people were like, 'Oh, look how much she's improved in the last year.' Sure, I improved in certain areas, but that was the Felice I always was. Before, I hid my anxiety before and during my fights. I finally found a way to relax." She sounds upbeat as she talks about her upcoming fight with Grasso. Having finished her morning training, she's headed to a cardio session, her voice lighter, even more than it was after the Curran fight. She talks jewelry -- specifically, a charm bracelet to which she adds a bauble every time she completes a fight. "I told myself a while ago that I'd at least fight until I filled up my bracelet with charms," she says. "That was two-and-a-half bracelets ago. I still have five spots left, and then I might need a new bracelet." Herrig knows she has fights ahead. Some, like Saturday's against Grasso, will be fought externally. But the really big bouts, the kind that can take a fighter not just out of the cage but out of commission, she'll need to wage with herself. Luckily, she's found her battle cry.